Unraveling A Washington Mall Confrontation, Frame By Frame : NPR Public Editor NPR's initial reporting would have benefited from even more restraint than it showed. Like other news outlets, NPR has been criticized for its coverage of the confrontation last Friday, Jan. 18, on the Washington, D.C. mall, near the Lincoln Memorial. That's when three groups of protesters intersected: a handful of protesters known as Black Hebrew Israelites; some attendees of the Indigenous People's March; and a group of Catholic high school students from Kentucky, who were waiting for a bus after taking part in the anti-abortion March for Life. Some of the latter wore "Make America Great Again" hats. Listeners and readers who have contacted the Ombudsman's office have questioned whether NPR jumped on the story too quickly or didn't update it quickly enough when conflicting narratives emerged, leading to a false narrative about the events. Here's what NPR's actual initial coverage entailed (which is different from what some critics are alleging) and my thoughts about it. Compared to what appeared on social media and some other news outlets, NPR's initial coverage was restrained. NPR did not report on the confrontation when the video first emerged on social media, and later on television outlets and in newspapers, on Saturday, Jan. 19. "Officials of a northern Kentucky high school are apologizing to Native Americans for the apparent actions of some students Friday in Washington D.C. As member station WEKU's Cheri Lawson reports, a video that went viral shows what looks like students mocking Native American drummers at the Lincoln Memorial. Students at the all-male Covington Catholic High School were on a field trip to attend the March for Life Rally in Washington D.C. Also on Friday in the nation's capital the Indigenous Peoples' March culminated with a rally at the Lincoln Memorial. 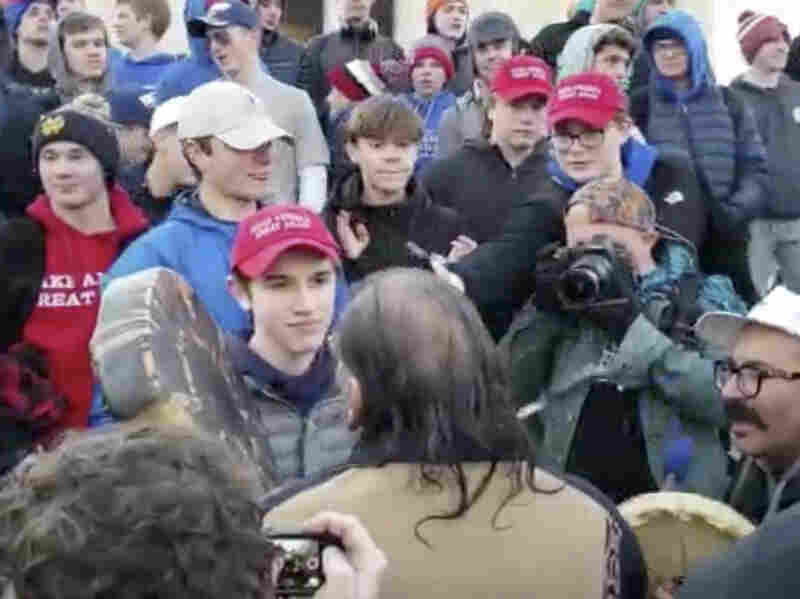 A video widely shared and highly criticized on social media shows young men, some in Covington Catholic High School garb and Make America Great Again hats, who appear to be ridiculing a small group of Native American drummers including Nathan Phillips, a Vietnam Veteran. Officials with the Diocese of Covington and Covington Catholic High School condemned the students' action and extended apologies to Mr. Phillips. Officials said, 'the matter is being investigated and we will take appropriate action, up to and including expulsion.'" A condensed 11 a.m. Sunday newscast repeated the official statements and referred to videos that "showed students taunting Native American drummers." There's no factual issue there; the multiple videos show, for example, students using a tomahawk chop. That newscast came just after NPR posted its first online story about the confrontation. It carried the headline, "Video Of Kentucky Students Mocking Native American Man Draws Outcry," framing the story as a standoff between the students and Nathan Phillips, an Omaha elder who was singing the American Indian Movement anthem and drumming. The story of the mall confrontation "was on fire long before we actually did it," Jim Kane, the deputy managing editor on duty that weekend, told me. He said the tipping point was the statements about the behavior of the students that were issued by the school and diocese. At that point, he said, "it was a news story and we had to do it." It's no longer possible to see the original version that NPR posted, since the current version has been updated. But Kane told me that the story was updated just a couple of hours after it was first posted, as more videos came in. Those videos, of course, show a much broader context. The student group was first verbally harassed by the Black Hebrew Israelites. Phillips is seen approaching the students and getting in between the two groups, contrary to what he had earlier told The Washington Post. Nick Sandmann, the student who was the focal point of an original video, is not smiling during some of the face-to-face standoff. And there's no evidence in the later videos to corroborate Phillips' contention that some of the students were chanting "Build that wall," a quote that was used in NPR's initial story. Kane said the story was updated as significant details became known, such as the fact that Phillips approached the students and not the other way around. But he argues that NPR's initial stories held up fact-wise. No corrections have been posted. "A lot of what changed is how people felt about it [the incident], not what was seen on the videos," he said. That Phillips did the approaching "didn't alter the facts," he added. "There were in fact kids in a circle around them chanting, many doing the tomahawk chop. That's taunting." He continued, "As we learned new information we added it." Indeed, it seems to be the perceptions that changed, in many cases. Much of the critical mail received in our office is clearly an after-the-fact reaction not just to NPR's reporting (again, it was largely restrained), but to the broader media spectacle and the resulting ugly developments, including threats against the students. I'm not taking an NPR-was-better-than-others stand. I evaluate NPR's coverage against its own standards. And Kane makes an important point that I think many critics of the news media often miss: Reporters report what they see and hear, and what they believe to be the truth based on other information they collect. As a result of that reporting, sometimes stories will become clearer over time, as more details emerge. It's not an exact science deciding when enough reporting has been done so editors can feel comfortable publishing or airing a story. Sometimes they are published too early, sometimes too late. One factor in the timing is the importance of the story; the more important the story, the faster it generally gets reported. I've heard from some critics inside the public radio system who feel NPR did not do enough diligence around its initial story, and that the update was not quick enough. Clearly, all the facts were not in. No student had been heard from, and the initial video itself was too short to show the broader context of how the standoff happened and what resulted from it. The only direct source heard from was Phillips, second-hand, and while he had a valuable perspective he later proved to be a somewhat unreliable narrator on the basic facts. So, there were important questions unanswered that would have justified waiting even longer to publish, particularly since this was not a story with breaking news implications. I've been trying to game out the best way NPR could have covered the story. How would it have been framed had more of the evidence been considered first? I think it would have looked more like this Monday, Jan. 21, online story that focused on the widely differing reactions to the events. That's not a bad thing. It would have meant that NPR was out of the national conversation about the incident for a bit longer, but NPR would not have added fuel to the conflict, either. Listeners can make up their own minds about whether the students deserved a break because they are young and had been initially provoked by the Black Hebrew Israelites, as Kentucky state Representative Adam Koenig told Morning Edition's David Greene on Tuesday. One also can question the role of the chaperones. Sandmann's perspective should be heard, along with that of Phillips (who on Monday, Jan. 21, told Greene that he thought the student was revising history in his account), and that of other Native Americans. All of that emerged in NPR's subsequent reporting, which I thought was solid, as was David Folkenflik's sum-up of the criticism of the media. The NPR-distributed show On Point also added valuable perspective. Kane said that overall "I'm pleased with the pace we took and the time we took to tell the story." My bottom line is that taking even a couple of more hours to try to pin down the broader context would have been best journalism practices. Caroline Kelly contributed to this report.